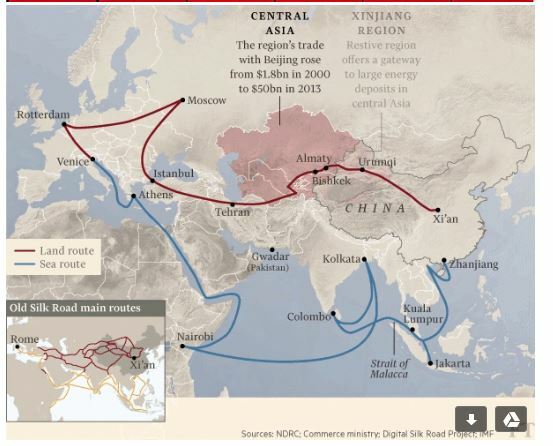 How will a modern Silk Road affect China’s foreign policy? This article first appeared on The Financial Times. He was describing the legendary surpluses of the Han dynasty, an age characterised by the first Chinese expansion to the west and south, and the establishment of trade routes later known as the Silk Road, which stretched from the old capital Xi’an as far as ancient Rome. Fast forward a millennia or two, and the same talk of expansion comes as China’s surpluses grow again. There are no ropes to hold its $4tn in foreign currency reserves — the world’s largest — and in addition to overflowing granaries China has massive surpluses of real estate, cement and steel. After two decades of rapid growth, Beijing is again looking beyond its borders for investment opportunities and trade, and to do that it is reaching back to its former imperial greatness for the familiar “Silk Road” metaphor. Creating a modern version of the ancient trade route has emerged as China’s signature foreign policy initiative under President Xi Jinping. “It is one of the few terms that people remember from history classes that does not involve hard power . . . and it’s precisely those positive associations that the Chinese want to emphasise,” says Valerie Hansen, professor of Chinese history at Yale University. Economically, diplomatically and militarily Beijing will use the project to assert regional leadership in Asia, say experts. For some, it spells out a desire to establish a new sphere of influence, a modern-day version of the 19th century Great Game, where Britain and Russia battled for control in central Asia. According to former officials, the grand vision for a new Silk Road began life modestly in the bowels of China’s commerce ministry. Seeking a way to deal with serious overcapacity in the steel and manufacturing sectors, commerce officials began to hatch a plan to export more. In 2013, the programme received its first top-level endorsement when Mr Xi announced the “New Silk Road” during a visit to Kazakhstan. Since the president devoted a second major speech to the plan in March — as concerns over the economic slowdown mounted — it has snowballed into a significant policy and acquired a clunkier name: “One Belt, One Road”. The belt refers to the land trade route linking central Asia, Russia and Europe. The road, oddly, is a reference to a maritime route via the western Pacific and Indian Ocean. In some countries Beijing is pushing at an open door. Trade between China and the five central Asian states — Kazakhstan, Kyrgyzstan, Tajikistan, Turkmenistan and Uzbekistan — has grown dramatically since 2000, hitting $50bn in 2013, according to the International Monetary Fund. China now wants to build the roads and pipelines needed to smooth access to the resources it needs to continue its development. Mr Xi started to offer more details about the scheme earlier this year with an announcement of $46bn in investments and credit lines in a planned China-Pakistan economic corridor, ending at the Arabian Sea port of Gwadar. In April, Beijing announced plans to inject $62bn of its foreign exchange reserves into the three state-owned policy banks that will finance the expansion of the new Silk Road. Some projects, already on the drawing board, seem to have been co-opted into the new scheme by bureaucrats and businesspeople scrambling to peg their plans to Mr Xi’s policy. “They are just putting a new slogan on stuff they’ve wanted to do for a long time,” says one western diplomat. As well as offering a glimpse of China’s ambition, the new Silk Road presents a window into how macroeconomic policy is made in Beijing — often on the hoof, with bureaucrats scurrying to flesh out vague and sometimes contradictory statements from on high. “Part of this is top down, part of this is bottom up, but there is nothing in the middle so far,” says a former Chinese official. Some clues emerged in March when the powerful National Development and Reform Commission, China’s central planning body, published a clunky document, “Visions and Actions on Jointly Building Silk Road Economic Belt and 21st-century Maritime Silk Road”. It provides a great deal of detail in some places — such as which book fairs will be held — but is patchy in others, like which countries are included. Peru, Sri Lanka and even the UK are included in some versions of semi-official maps but left out of others. A complete list appears to exist, however. On April 28 the commerce ministry announced that Silk Road countries account for 26 per cent of China’s foreign trade, a remarkably precise statistic. However, a request from the Financial Times for more specific details on the list of nations went unanswered. There is also no indication yet of how it will be run — through its own bureaucracy, or as separate departments in different ministries and policy banks. With foreign governments and multinational banks eagerly following the Delphic utterances from Beijing to understand what it means, the vagueness and confusion has not gone unnoticed. As the country’s economic interests expand abroad, its massive security apparatus and military will probably be pulled into a greater regional role. China has no foreign military bases and steadfastly insists that it does not interfere in the domestic politics of any country. But a draft antiterrorism law for the first time legalises the posting of Chinese soldiers on foreign soil, with the consent of the host nation. China’s military is also eager to get its share of the political and fiscal largesse that accompanies the new Silk Road push. One former US official says he was told by senior generals in the People’s Liberation Army that the One Belt, One Road strategy would have a “security component”. Projects in unstable areas will inevitably test China’s policy of avoiding security entanglements abroad. Pakistan has assigned 10,000 troops to protect Chinese investment projects, while in Afghanistan, US troops have so far protected a Chinese-invested copper mine. Port construction in countries like Sri Lanka, Bangladesh and Pakistan has led some analysts to question whether China’s ultimate aim is dual-use naval logistics facilities that could be put into service controlling sea lanes, a strategy dubbed the “String of Pearls”. Achieving the trust of wary neighbours including Vietnam, Russia and India is not a given, and is consistently being undermined by sustained muscle flexing by China elsewhere. In the South China Sea, for example, naval confrontations have increased in the face of aggressive maritime claims by Beijing. Lenin’s theory that imperialism is driven by capitalist surpluses seems to hold true, oddly, in one of the last (ostensibly) Leninist countries in the world. It is no coincidence that the Silk Road strategy coincides with the aftermath of an investment boom that has left vast overcapacity and a need to find new markets abroad. Like the Marshall Plan, the new Silk Road initiative looks designed to use economic treats as a way to address other vulnerabilities. China’s western frontiers and its central Asian neighbours are home to vast reserves of oil and gas. The Xinjiang region, sitting on some of China’s largest energy reserves and crucial to the Silk Road project, is also home to a restive Muslim Uighur population that is culturally Turkish, far poorer than the citizens of coastal China and seeking a break with Beijing. The region has been the scene of serious outbreaks of violence in recent years. A push into central Asia will partly fill the vacuum left by the retreat of Moscow after the cold war, followed by Washington’s military pullback from Afghanistan next year. With Beijing saying it is facing a rising terrorist threat, stabilising the wider region is a priority. But, in doing so, China will inherit the same chicken and egg problem that has plagued the US in its “nation building” attempts — having to ask whether security and stability is a pre-requisite for economic development, or whether, as Beijing appears to believe, it can pacify local conflicts with a sea of investment and infrastructure spending. If this approach does not work, China will be faced with some grim alternatives — either turn tail and leave, or risk getting bogged down in security commitments and local politics. It has made clear that it does not want to replace the US in Afghanistan nor does it see itself as a regional policeman. “China will not fall into the same mistakes,” says Jia Jinjing, a specialist on south Asia at Beijing’s Renmin University. Economic development, strategists in Beijing argue, will remove the appeal of radical Islam in China and Pakistan, Afghanistan and central Asia. But critics note that culturally insensitive policies, an enormous security presence and economic strategies that benefit Chinese communities at the expense of locals have so far only escalated tensions in Xinjiang, the desert region that has 22 per cent of China’s domestic oil reserves and 40 per cent of its coal deposits. Roads and pipelines across Pakistan and Myanmar will ultimately allow China to avoid another strategic vulnerability — the chokepoint of the Strait of Malacca, through which about 75 per cent of its oil imports pass. Already, half of China’s natural gas arrives overland from central Asia, thanks to an expensive strategy by Mr Xi’s predecessors to cut dependence on seaborne imports. While some neighbours will welcome the investment, it is less clear they will want China’s overcapacity. Many have unemployment and underperforming steel mills of their own, or ambitions to develop their own industry rather than import someone else’s. Large-scale investment could also trigger concerns about opening the floodgates to Chinese economic dominance — as it has done in Myanmar and Sri Lanka — and, by extension, political influence. But China is hoping the lure of massive spending will prove too great an incentive for its neighbours to resist. This article first appeared on The Financial Times. Publication does not imply endorsement of views by the World Economic Forum. Image: A Chinese national flag flutters at the headquarters of a commercial bank on a financial street. REUTERS/Kim Kyung-Hoon.